I was all prepared and set to have my first official visit to Channapatna – a town nearly 80 kms from Bangalore which is famous for its toys crafted by lac-turnery. I was heading towards the bus stop for venturing into my new project of development of products by the use of the Lac-turnery craft of Channapatna when I received a call from a friend who with her family (husband and kid) wanted to join me for my excursion. 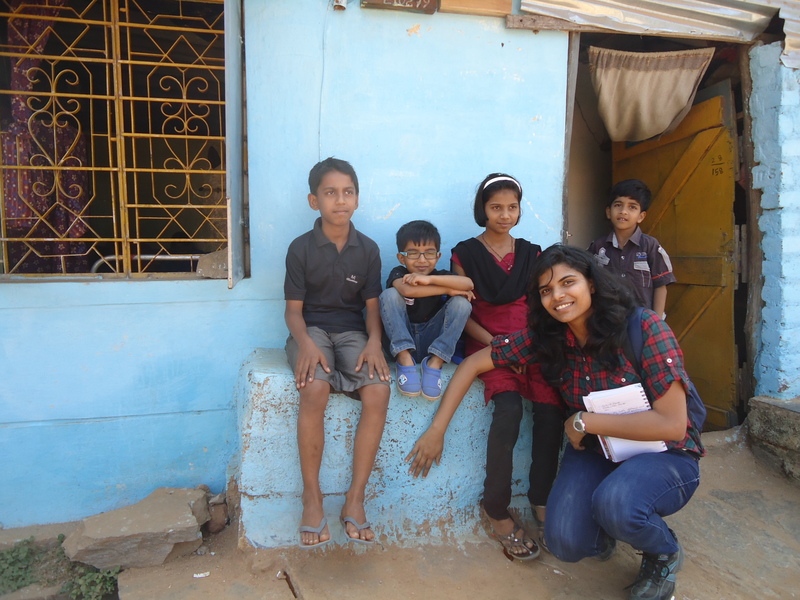 Soon enough, the four of us including me, my friend her husnband and her 5 year old child left for the ‘toy town’ or ‘Gombegala Ooru’. Heading towards the south-west of Bangalore we reached the destination in an hour and a half while enjoying the beautiful Bangalore-Mysore highway. We landed at the Lacquerware Craft Complex which is looked after by the Karnataka Government. 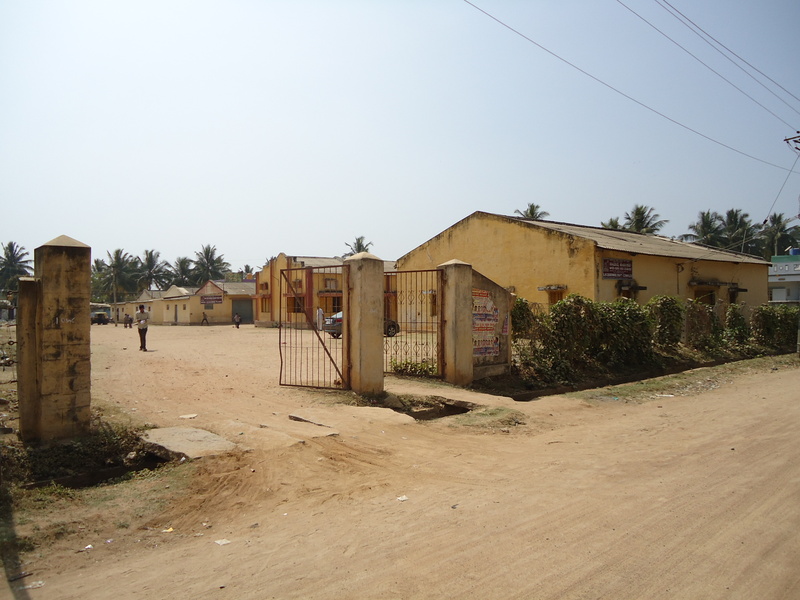 This is a factory which produces the traditional lac-turnery crafted objects and toys for the Cauvery Emporium. Although this was my first official visit, I had visited Channapatna very recently for getting acquainted to the area and the place. 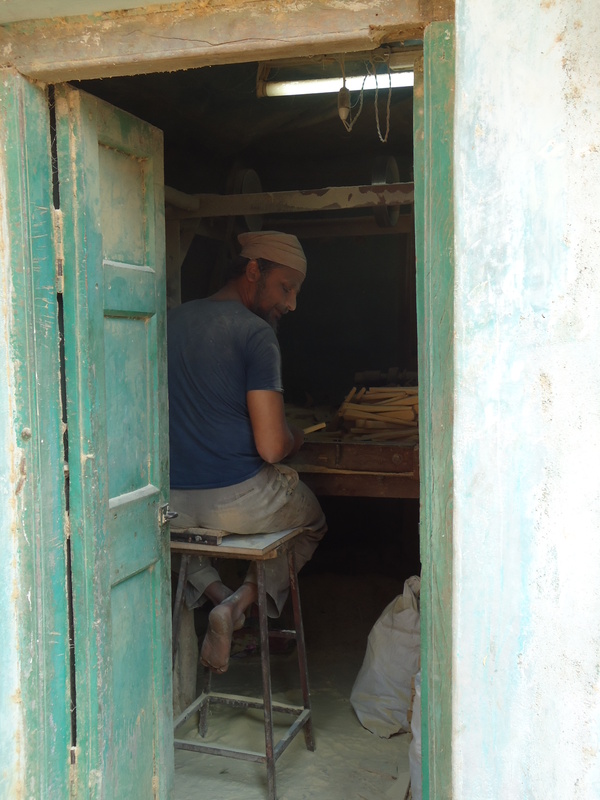 The artisans working there recognized me easily and were very welcoming. I thought that this was a good start to intervene and know more about the artisans, their craft, their tools, their life, their problems their way. I started taking photographs of the factory where the process of toy-making was happening. I recorded all the tools and the process of their work for my documentation. 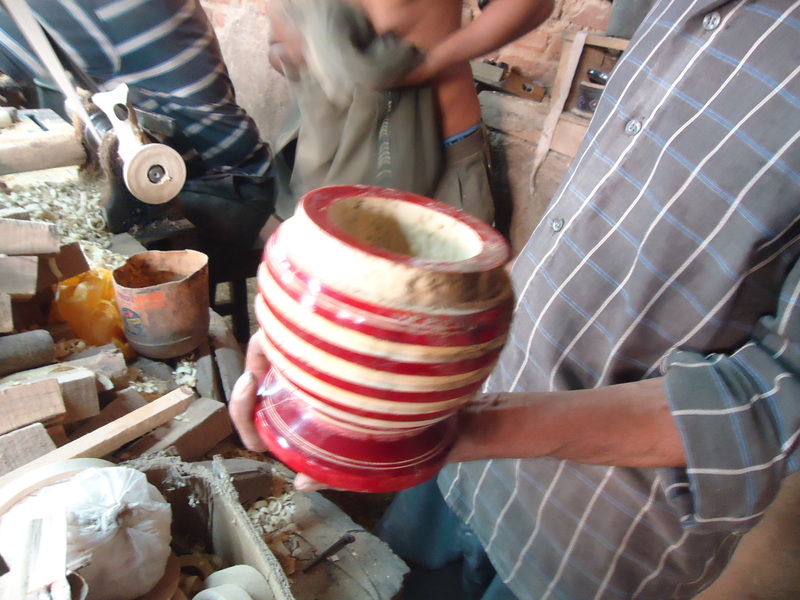 It was an interesting observation to see how these artisans had a competition among themselves to sell their products. I saw the way everyone opened their ‘pitaris‘ (boxes) and surged towards my friends to sell their products. The same thing happened with me the last time I visited them. My excited was short lived when on talking to them I discovered that they get their money based on the sale of their one product and not collectively by completing their order. After various visual recordings of the processes we moved further into the village to map more people working on the craft. 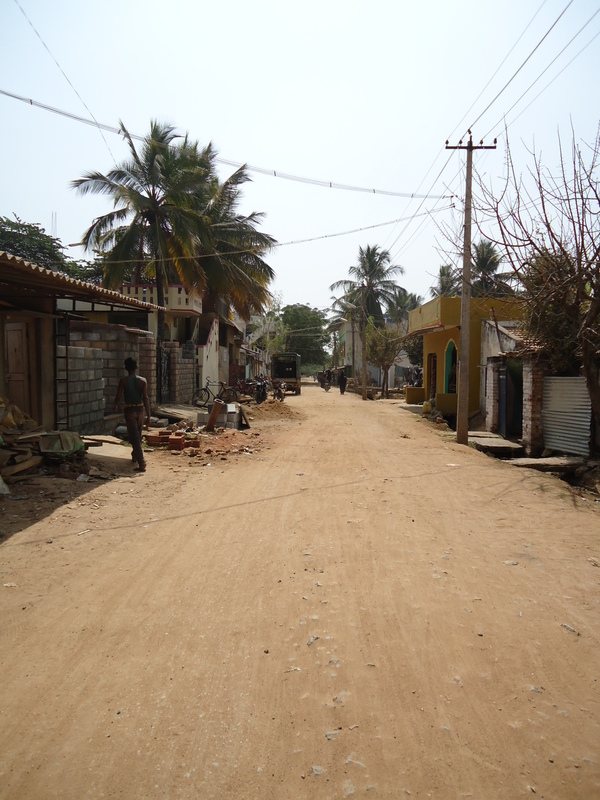 While I walked, I felt refreshed to be in a typical village and watch the streets filled with huts and mud houses. Although the sun was radiating scotching heat, but this could not let my enthusiasm down. It was the peak hour of the afternoon and thus the streets were barren. Somewhere here or there we could see some Muslim ladies walking and reaching their places. The whole place seemed like being dominated by the Muslim community. 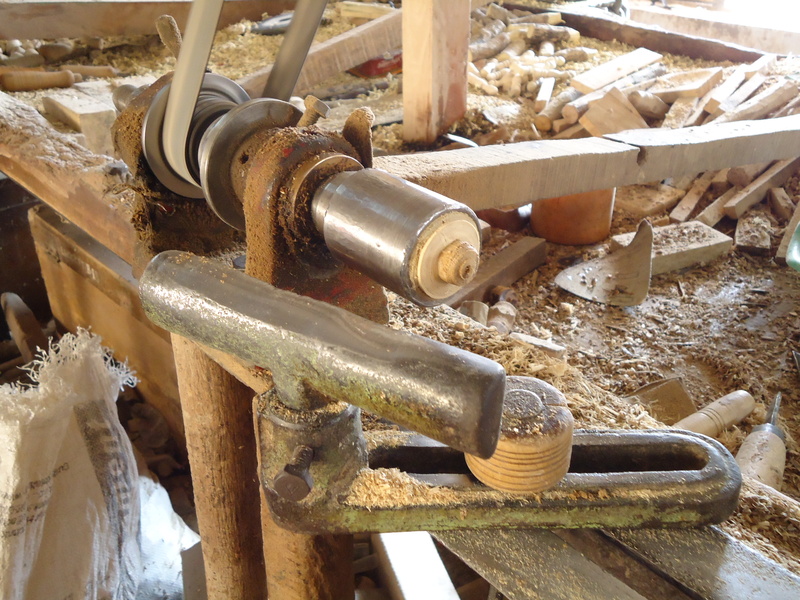 While walking through one of the streets, I spotted a person through a small door who was working on his power lathe. I wished to enquire more about his practice and then I knocked and entered. To my amazement, the man was working on the power lathe in about a volume of 336 cubic feet (8ft. X 6ft. X 7ft.). As I entered, I was choked with the dust and other small particles of wood which were entering my nose and mouth as I spoke. I came out for a breath and felt pity. On my enquiry, the artisan informed me that he worked there for 10 to 11 hours a day. I could only think of the health hazards that were being faced by these craftsmen. In a larger space, these are not evident, but in a smaller space, the hazards seemed deadly. 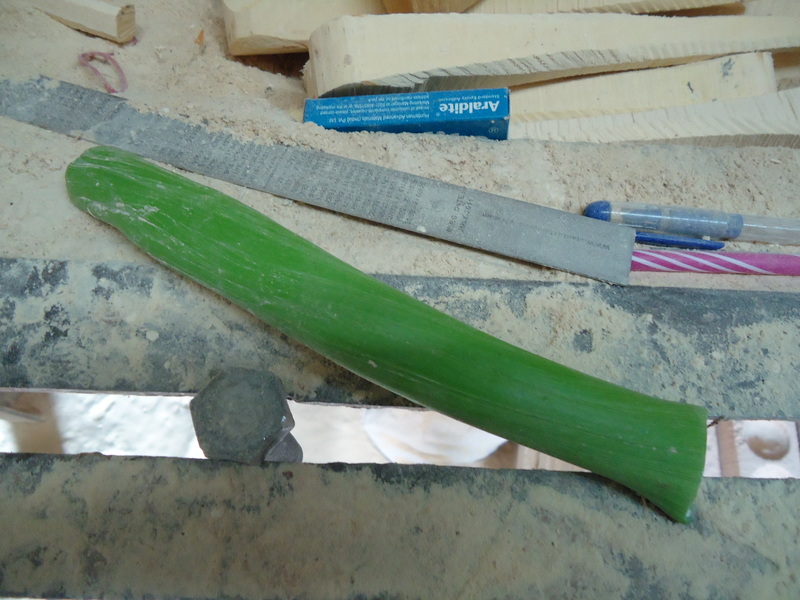 I was made to acknowledge the presence of zinc compounds in the lacquer sticks for use in the turnery craft. Recently, the use of zinc in lacquer has started due to less prices of the zinc mixed lac over the vegetable dyes lacquer. This information about the lacquer sticks, made me worry about the toys for the children. I was further told that in the toys the vegetable dye sticks were used. The zinc lacquer was used only in the utility items which were used by adults for home decorations. After listening to all this, I could only think about the words by Jaya Jaitly where she mentioned that the crafts of India have a greater importance – that of being environmental friendly. I thought to myself, if I really succeed in providing a better market for this craft, I might just be able to improve the economic conditions of these artisans. This may lead to solving their problems related to the availability and prices of raw materials. This still solely depends on the ethics of the craftsmen. 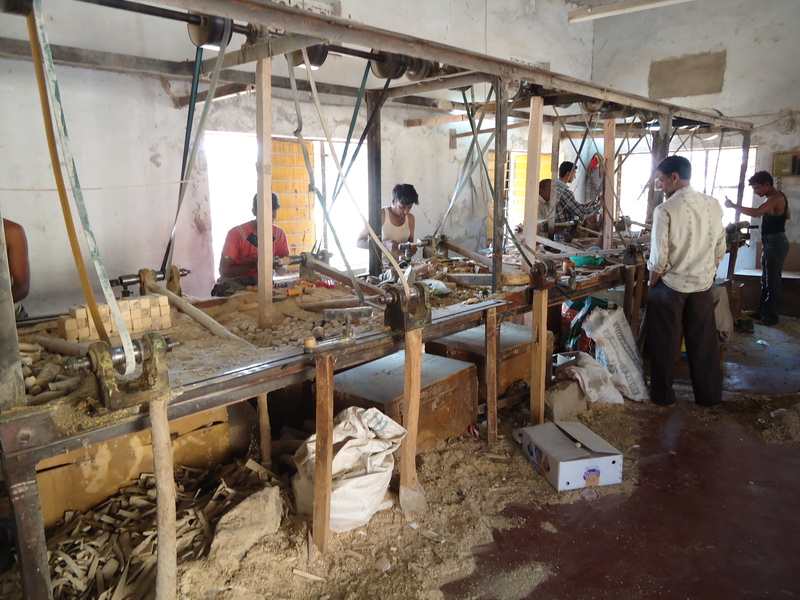 Further, as the day was passing by, I with my small group that day kept walking towards the interior of the village to discover something that I had read about in text books, which was being used by only the women – a hand lathe for producing lac-turned products. I read in a case study based on the Lac-turnery craft of Channapatna that women’s position in this craft was deteriorating because of lack of technological inputs and training. I had read that women were not given a platform to keep themselves involved in the lac-turnery craft as much as the male counterparts. Before going for this field visit, I had a perception that there is a need of women upliftment in this craft and if I impart knowledge to these women in terms of the market requirement and design, they could probably establish themselves better. 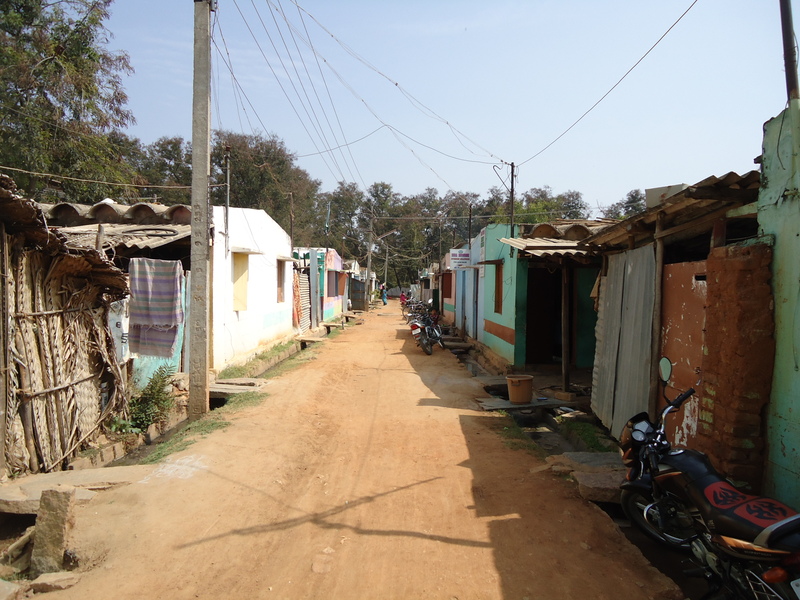 To my horror, when I visited Channapatna officially, to observe various things, I became aware of the current fact that women no longer work in this craft. They have stopped their work in it completely. I couldn’t see a single woman working in this sector. On my enquiry to people about whether women work in this craft all I could be answered was, “Madam, aurat isme kaam nahi karta, sirf aadmi karta hai. Wo aurta sab bidi banata hai.” (Madam, women don’t work in this field, only men do. All those women make cigarettes). This was indeed sad but true. Indeed, the cigarette factory pays Rs. 150-Rs. 250 to their workers per day for making 1000 bidis daily. I learnt about this scenario when I went inside the village with the help of a local 12 year old kid named Zishan, who showed me a house where a man with his wife worked on a hand lathe machine to prepared lac-turned items. I could not see any woman working in the whole village. 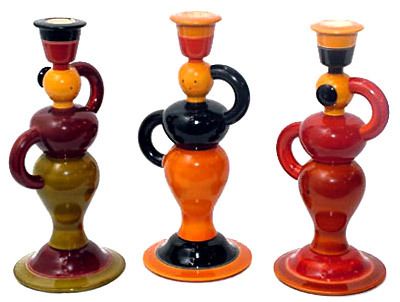 The range of items produced by the hand lathe is limited to three products due to the use of the hand machine. 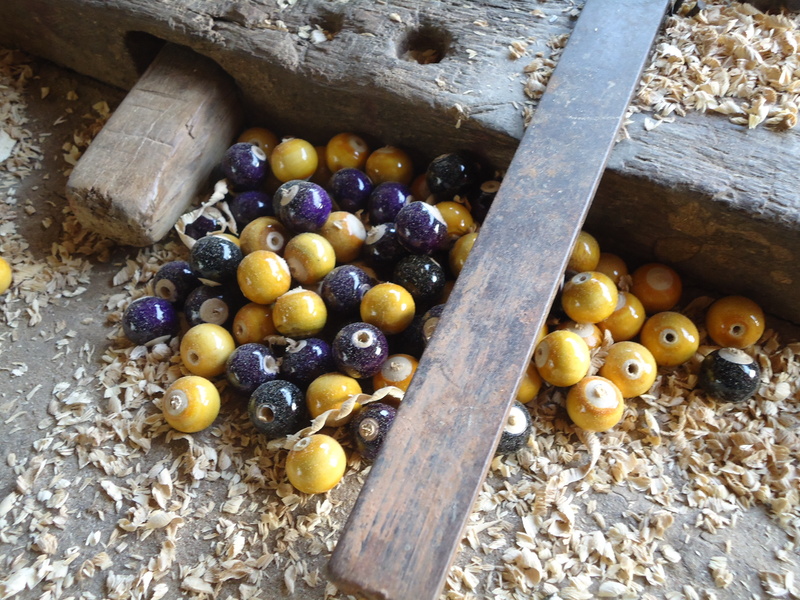 They only produced 10mm diameter beads, 10-12mm disameter flat buttons and some keyrings. On being questioned about the non usage of the power lathes, they simply answered cannot afford it and they get a lot of orders for the these items. I could only gaze at their way of working and limitation due to which they could not grow much. I took some photographs with Zishan, his sister and a few more kids who had gathered around getting attracted by the camera and may be the language and attire. But they all were smiling and yet welcoming. There was a conversation problem due to the language which could not be solved even by my Telugu friends. Thus, I could not question them more and just thought that next time I will get a Kannada speaking friend with me. My next step was to interview the artisans to know how they felt working, if there were any problems that they were coming across in any context of the craft or due to it. On speaking to a about three-five people, it came to my knowledge that the main problem is the raw material procurement. The artisans had a huge problem getting the material from the forests as they had to pay taxes to government which they said they couldn’t afford. Their other problem was they had no growth in the field. They were producing goods as per the demand but did not get any profit. By the time money was transferred to the bottom of the supply chain, it was over. 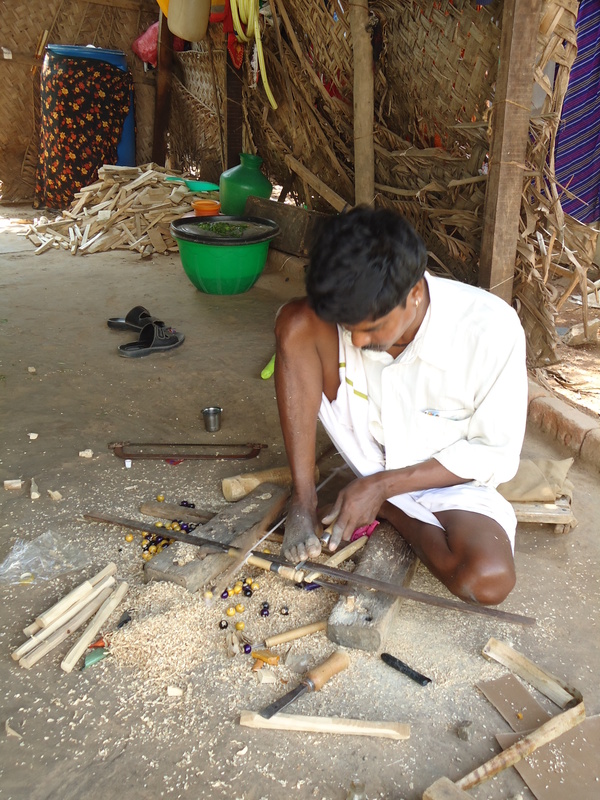 The last layer of the chain – the artisans had to convince themselves with the wages that they earn generally. I was thinking throughout, that will increasing the market solve any purpose for them? I thought that I have to find a way to eliminate intruders from the supply chain so that profit can be made for the artisans. The other aspect for development that came to my mind was the enhancement of the product range itself. A range that has immense demand for its aesthetics. But the hurdle for my thought was that only developing a new range won’t solve the purpose. I simply thought about the things that will happen once I leave this place. I don’t think that the artisans will continue producing new products. I believe that I now have to train these men. For developing on their own. Educate them to an extent that they think anew, afresh. 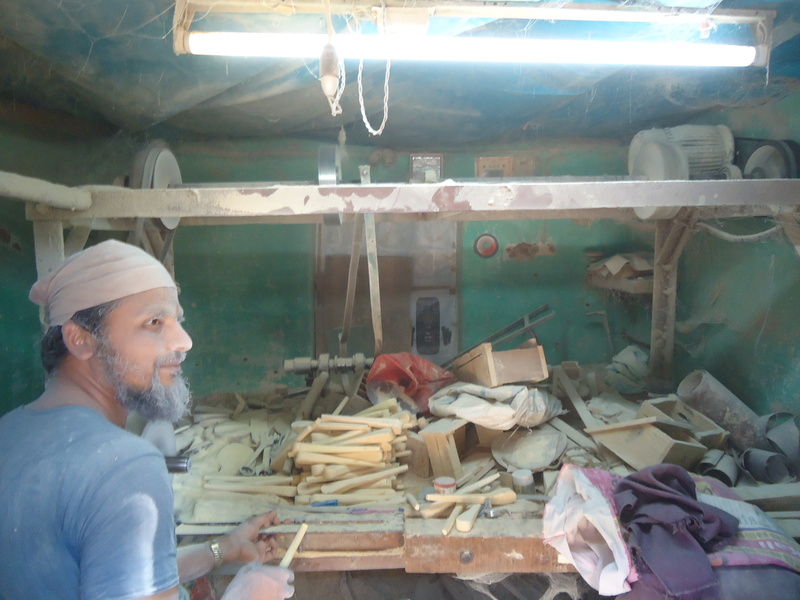 While I was on these thoughts while listening to the artisans who were speaking to me, my thought process was interrupted by an artisan who was very eager to show around the various factories that his nephew was working in – stone and lac-turnery craft. I and my friend initially started with that person thinking that we will be back in 10 mins but that small visit slowly converted into a voyage. A voyage to the village on foot – exploring various kinds of factories of lac-turnery craft and wood craft which produced different varieties of products – some were small scale like key rings, small toys etc.and some were a little bigger utility items like jars, flower vases etc. 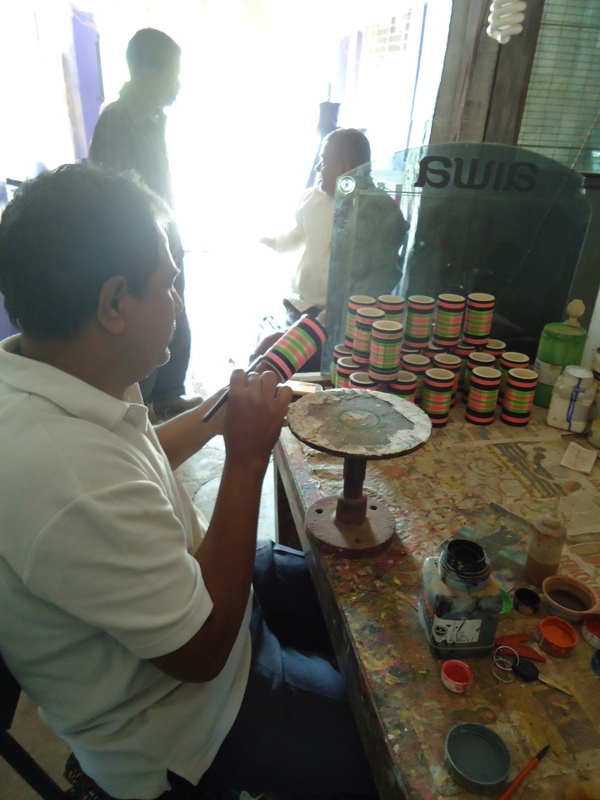 Some were artists who were painting with poster colors and then turning them with lac and some were carpenters who developed school trophies and other items on their own. Throughout the expedition, I was filled with energy and happiness to look around so many people. My friend, Ankita, was there to continuously instill in me with the do’s and don’t’s that could possibly be in terms of work and surrounding. This visit to Channapatna was a very informative, fruitful and thoughtful journey. Suggestions and comments from my friends who were with me were worth seeking answer to and also to keep in mind further. Will be continuously going ahead to seek and develop something that comes my way from my research.